Notes: Bethesda takes its name from a nonconformist chapel in the town. Although the chapel is still exists it is no longer in use as such and has recently been converted into apartments. The town stands at the northern gateway to the magnificent Snowdonian scenery of the Ogwen valley, but it is unashamedly industrial in character and owes its development to the massive Penrhyn slate quarries immediately to the south. 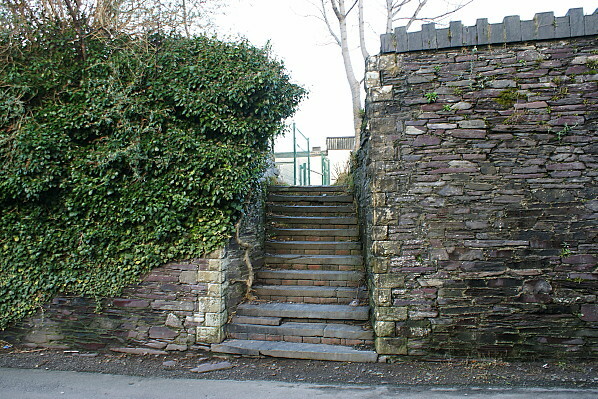 three times (twice under and once over) and was built primarily to move slate from the quarries in the area. Bethesda station was located at the northern end of Bethesda village to the west of the Holyhead Road (the modern A5) and on the north side of Station Road. It was situated on the west side of the line and provided with a single 430ft platform. The station building, constructed – inevitably! – in stone, was towards the southern end of the single 430ft platform, west of the line and also of stone. The two-storey station building, which included the stationmaster’s living quarters, was sturdy and elegant, consisting of two wings with gable-ends facing the platform and a short central section. Window openings were plain and rectangular. The slate roof was embellished by cresting and small finials above the gables. Shelter was provided by a shallow-ridged platform awning. A single-storey range extended north from the station building. A run-round loop was provided at the station. There was a ground frame on the station platform towards the southern end that was a block post, the block instuments and bells would have been located inside the station building. 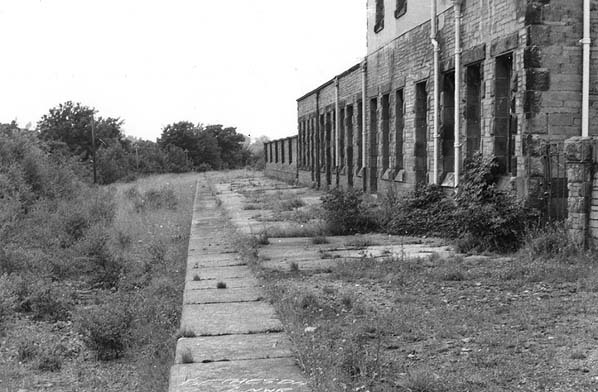 To the west of the station, behind the platform, was the goods yard with an office, shed and five sidings. The goods shed was constructed from timber with a slate roof. The yard had a 5-ton hand-operated crane and could accommodate 121 wagons. It also had cattle pens and a loading dock, and there were, in addition, privately owned coal wharves. Bethesda handled mainly coal and agricultural foodstuffs inward and slate traffic outward. An 1889 map shows that there was a signal box at Bethesda located to the north of the station and goods facilities on the east side of the line. From 1900 the box was still shown on maps but it was no longer labeled as a signal box. From the start passenger services ran between Bethesda and Bangor. The December 1895 timetable showed five departures and five arrivals at Bethesda on Mondays-to-Fridays. There were six trains on Saturdays. Originally standard trains operated with locomotives and coaches. The locomotive was able to run around its train at Bethesda and at Bangor. In 1906 the LNWR introduced a single-coach rail-motor to the service. It operated for a few years but was replaced in 1910 with two-coach push-and-pull trains that used 0-4-2 tank locomotives fitted to operate in push-pull mode. The locomotives were coupled to two coaches, the coach further from the locomotive having a cab so the driver could control the train from that end via a pulley and bell system. When the driver was in the coach end of the train the fireman operated the locomotive alone. On the Bethesda branch the push-and-pull sets were arranged so that the locomotive was at the Bethesda end of the train. It pulled the train up to Bethesda and pushed it down to Bangor - although due to the gradients it would have had to do very little pushing. By July 1922 the service operated by the push-and-pull trains had improved, there being eight departures and eight arrivals on Monday-to-Friday as shown in the table below. The journey to Bangor took eighteen minutes. On 1 January 1923 Bethesda became part of the London Midland & Scottish Railway (LMS). The LMS introduced a country lorry service from Bethesda, operating from the station goods yard, which undertook deliveries and collections at farms and businesses in the surrounding area. The LMS summer timetable for 1932 showed Bethesda as having sixteen arrivals and departures on Monday-to- Friday with nineteen on Saturdays. There were even nine trains on Sundays. A good service continued to run throughout the 1930s despite competition from local buses. During the Second World War the Bethesda service was cut back dramatically and when the war ended it was not restored to its former frequency. In August 1947 a climbing accident in the locality resulted in a fatality. On 6 August 1947 the LMS dispatched a hearse van hauled by a former LNWR 0-6-0 goods locomotive to Bethesda to collect the body. A siding that had seen little activity for many years was used, and when the locomotive and van were departing the locomotive became derailed and fell sideways; only a telegraph pole stopped it falling over completely. The accident happened at 9.30am and it took until 4am on 7 August to clear it. The Bethesda branch became part of British Railways (London Midland Region) on 1 January 1948. The summer timetable for 1948 showed eight Departures and eight arrivals on Mondays-to-Fridays as seen in the table below. With such a poor service and strong competition from local buses the Bethesda branch had become unprofitable by 1950. Typically, by this time, trains on the branch consisted of only one coach. British Railways proposed withdrawal of passenger services in 1951, and despite strong local opposition the last train ran on Saturday 1 December 1951. 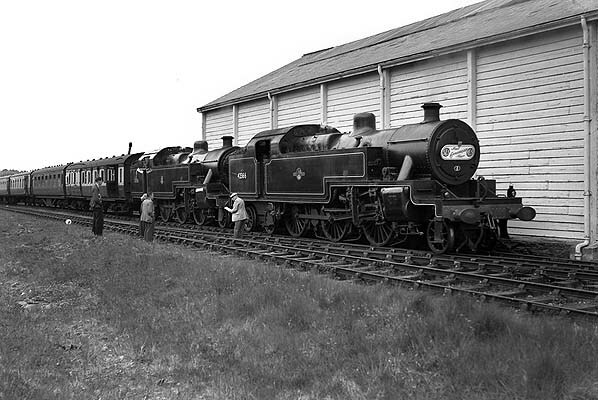 The train was worked by 0-6-2T locomotive number 58903, driven by Huge Caulfield and fired by Eric Lynn. Bethesda and the other stations on the line formally closed to passengers on 3 December 1951. On 11 February 1954 Bethesda ceased to be a block post and the instuments and bells would have been removed. On 5 May 1957 the Stephenson Locomotive Society 'Caernarvonshire Rail Tour' visited Bethesda. The track had been removed from the passenger station so the tour stopped adjacent to the goods shed. Goods services continued to run to Bethesda after closure to passengers, but as the years went by they became more sporadic. 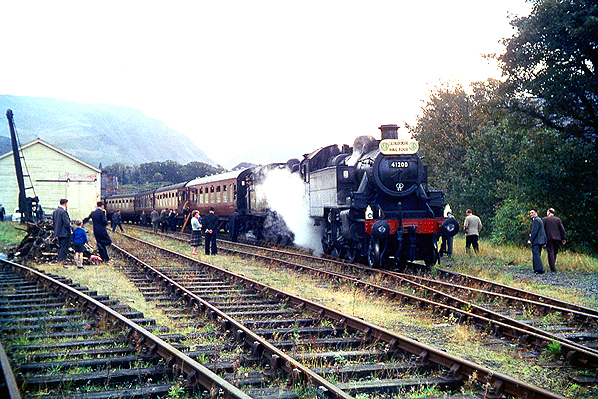 On 20 October 1963 the Stephenson Locomotive Society ran another ‘Caernarvonshire Rail Tour’ to Bethesda. It was the very last train ever to travel along the branch. After it had departed the line was formally closed and road vehicles began track-lifting the following day. The Bethesda station building survived until the 1970s, when it was demolished and a social club was built on its site. In 2010 a health centre was built on part of the station goods yard site. Bethesda station looking north. 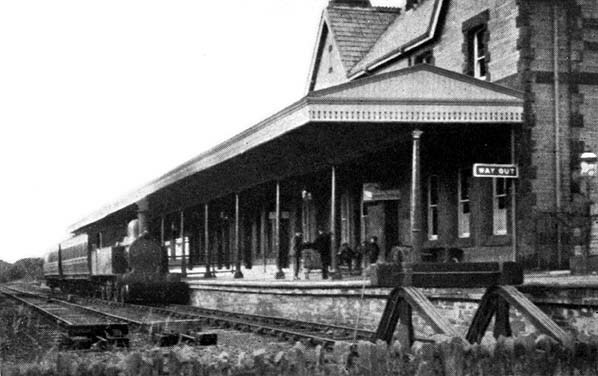 A train stands at the platform in 1927. By this time, the branch was operated with two-coach push-pull trains. Bethesda station shown on an 1889 map. Bethesda station looking south. On a sunny day in the late 1940s, a single-coach push-pull train stands at the buffers. The run-round loop can be seen under the end of the coach, although it would have seldom been used by this time. The SLS/MLS Caernarvonshire Rail Tour of 5 May 1957 stands at Bethesda goods shed. The lines into the passenger station had been lifted by this time. Taken from the same location as the 1940s picture above, in the late 1950s. The track has been lifted, and the station canopy has been removed. 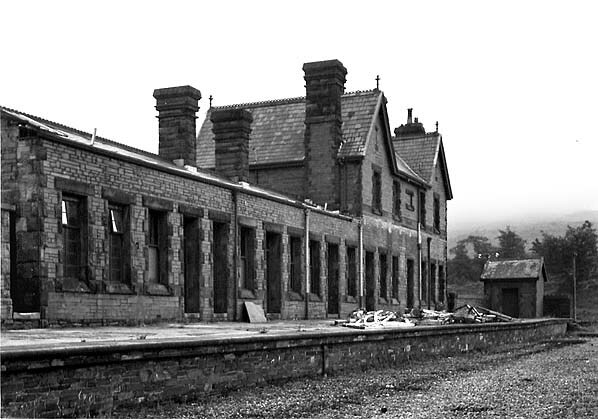 The gas lamps and pipe work had even been removed from the station building. 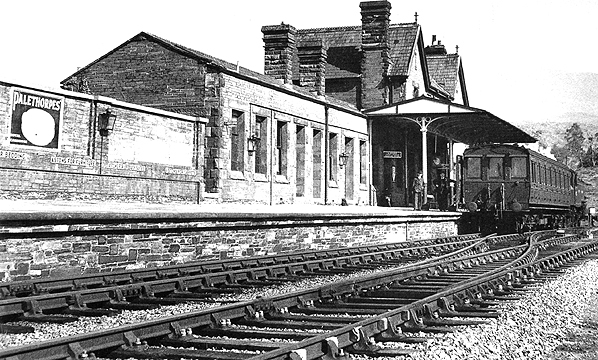 Another view looking south along the platform in the early 1960s. The remains of the station canopy have been cleared from the platform, and vegetation is starting to take over. Taken from the south end of Bethesda station platform, looking north, also in the early 1960s. Ten years before, the station was still in regular use. Looking north towards Bethesda station on 20 October 1963. The Stephenson Locomotive Society (SLS) Caernarvonshire Rail Tour is seen standing on one of the goods yard sidings. To its left can be seen the goods shed and the yard crane. The passenger station is glimpsed in the distance behind the train. It had lost its track after the passenger service had been withdrawn. The trackbed of the line that had led into the station is seen to the right of the train. Looking north-west on 31 January 2013 from a point towards where the south end of the platform would have been. 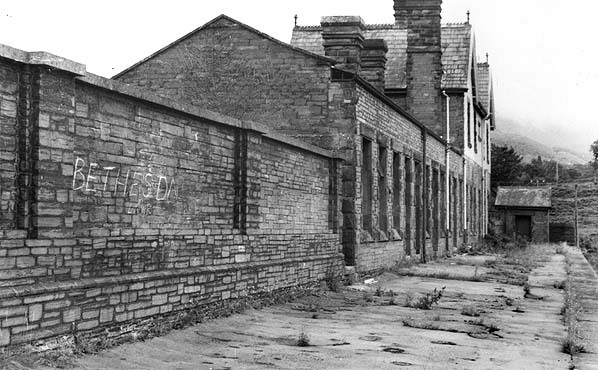 After demolition of the station in the 1970s a social club was built on the site. Looking up the access steps from Station Road on 31 January 2013. The social club in the background indicates where the station once stood. would have been to the right.